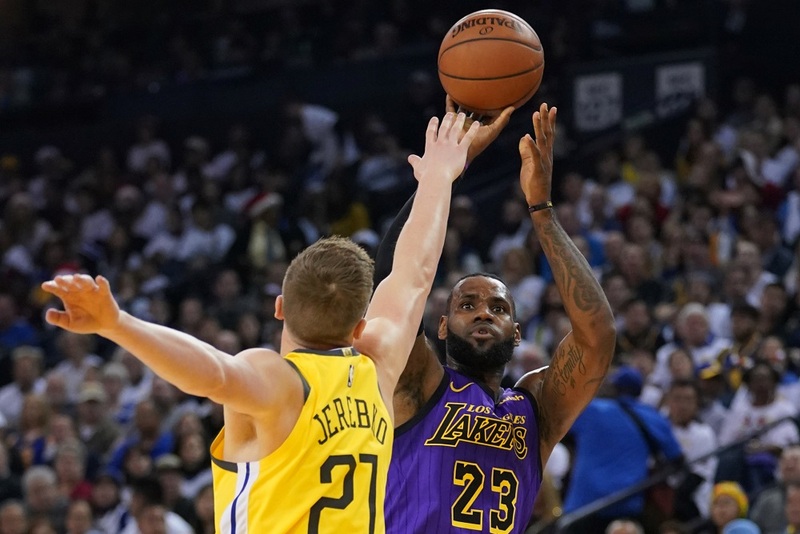 Los Angeles Lakers forward LeBron James (23) shoots the basketball against Golden State Warriors forward Jonas Jerebko (21) during the first quarter at Oracle Arena, Oakland, CA, Dec 25, 2018. Shanghai and Shenzhen, brace yourselves-LeBron James looks like he's coming to town after the teams for this year's NBA China Games were revealed on Tuesday. King James' Los Angeles Lakers will face the Brooklyn Nets on Oct 10 in Shanghai, followed by a trip south to Shenzhen on Oct 12. Fourteen-time All-Star James is currently chasing his fourth NBA championship with an exciting young Lakers roster that includes rising stars Brandon Ingram, Lonzo Ball and Kyle Kuzma. "The entire Los Angeles Lakers organization is excited to return to China to play in front of the passionate Chinese fans," said Kuzma, who was named on last season's NBA All-Rookie first team. "During my visit to China, I was absolutely amazed by the fans' love and excitement for the game of basketball ... I know the atmosphere at the games will be great." The Nets, under the ownership of Mikhail Prokhorov and Joe Tsai, the executive vice-chairman of Chinese e-commerce giant Alibaba, also boast a talented young squad, including D'Angelo Russell, Caris LeVert, Jarrett Allen and Spencer Dinwiddie. "It's an honor to help celebrate basketball's growth abroad, and represent Brooklyn and the league on an international stage," said LeVert, the 20th overall pick in the 2016 draft. "The Nets have a connection to fans all over the world, and I am thrilled to have the opportunity to visit China and play for our Chinese fans for the very first time." It will be the second visit to China for the Lakers, following their 2013 matches in Beijing and Shanghai. Megastar James last played in the series with the Miami Heat in 2012, in Beijing and Shanghai, and with the Cleveland Cavaliers in 2007, stopping in Shanghai and Macao. The Nets were last here in 2014, playing in Beijing and Shanghai, and also visited in 2010, in Beijing and Guangzhou. "We would like to extend our warmest welcome to the Los Angeles Lakers and Brooklyn Nets as we celebrate the 27th and 28th NBA games in China," said NBA China CEO Derek Chang. "These games are the pillars of our efforts to bring authentic NBA action to our Chinese fans. I want to thank the cities of Shanghai and Shenzhen for their support and commitment." The preseason tour will also feature the eighth annual NBA Fan Day, presented by Dongfeng Nissan in Shanghai, during which the public will be treated to a performance by Chinese celebrities and be able to watch the Lakers and Nets perform on-court drills. Some lucky fans will even get the chance to team up with players and celebrities in a shooting contest. The Fan Day will be broadcast live and streamed through NBA China's media platforms. The league and its partners will also conduct a series of NBA Cares community outreach activities in both cities. The NBA China Games 2019, presented by Vivo, will be available in over 200 countries and regions on television, digital and social media. King James takes top billing as Lakers and Nets confirmed for NBA showcase.